Did you know they now have culinary camps for kids? Well, until my editor sent me an article about them, I sure as hell didn't. Not to sound like the old person I clearly am (proof: I can't even eat too heavy of a dinner any more, because it will keep me up all night) but in my day, camps were about roughing it, not about complaining if the accommodations are "overly rustic." As a traumatically picky kid, I can't imagine being interested in eating -- much less making -- crab-stuffed prawns or the perfect béchamel. In fact, my biggest food concern at Camp Widjiwagan (Widji) in northeastern Minnesota was where I was going to bury my lump of falafel where the bears wouldn't treat it as an amuse bouche before making me their main course. I think it's probably fair to say that I shocked my parents the summer I expressed a desire for the adventurous and outdoorsy side of life. Given that I got homesick during Girl Scout day camp, I guess spending two weeks skirting the Canadian border was a bit of a leap for me. I simply wasn't a go-away-to-camp sort of person. I preferred being at home in my own bed with my family and cats and its decided lack of bear-proofing chores and nightly tick checks. 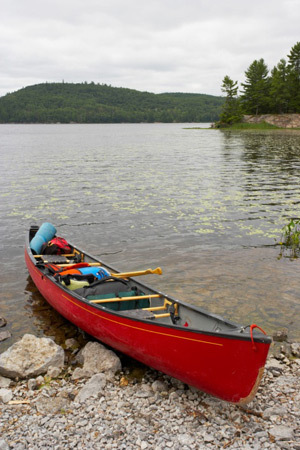 However, two of my closest friends wild about the Widji idea, and I didn't want to be left out, so I gave my mom the application, ignored her skeptical eyebrows, and started getting ready for the green and scented sylvan wilds of the Boundary Waters Canoe Area. Planning for Widji was elaborate. The list of required gear alone was daunting. Mom and I shopped for a three-season sleeping bag, a mess kit and a net bag for hanging it to dry, hiking boots, all manner of specialty clothes and hats, rain gear, toiletries, and thick, itchy stacks of wool socks. This is when I learned that while wool was scratchy and hot, it was the preferred fabric for outdoorsing because even when wet -- and our feet would be wet 75% of the time -- it kept you warm. And then there were the hiking boots. Those hiking boot were a metaphor for my entire teenage wardrobe. Aside from an Esprit shirt (note the singular? I only ever worked ONE out of my mother, and it was from the sale rack. And it was a dingy puke green with neon pink lettering. And was slightly too small), and the occasional pair of Guess jeans, I was hopelessly fashion backward. Actually, "backward" doesn't quite describe me, since it might imply that I was retro or vintage when I wasn't. Maybe "fashion stalled" is more accurate. Hanging out on the edge of Lake Burntside, Widjiwagan is your typical north woods camp: scads of lofty pine trees, cabins furnished as sparsely as possible, a large mess hall, and acres of real estate dividing the girls' side from the boys' side. There were no showers, toilets were outhouses (or "biffies," in the Widji vernacular), and the only way to wash your hair was to stick your head under a coldwater spigot sticking out of the ground. You had to bend nearly double to get your head under it while also trying to keep your clothes dry and work your shampoo into a lather. It wasn't pleasant. Speaking of unpleasant, because of the lack of showers and a naively utopian idea that the Great Outdoors has no room for primping and vanity, a lot of Widji girls stopped shaving their legs at camp. Which...is fine, but since I wasn't blessed with fine blond leg hair that obediently lay flat and glinted golden highlights on tan legs when it grew lush and long, I spent a lot of time and skin in surreptitious acts of dry shaving. Right before going out on Trail, we all marched over to the nurse's office for a mandatory foot check. Since we were about to spend a number of days on them, our feet were considered our most valuable piece of equipment. The foot check was to make sure no open sores or gashes made it out of camp, because if you got an infection you'd have to be Medivaced and no one wanted that. If I recall, there were a lot of things that could get you Medivaced -- broken limbs, concussion, leech-based anemia, etc. -- but the worst one was constipation. Being sent home purely for not pooping was something everyone wanted to avoid, and it's why everyone dutifully finished their lunchtime raison ration. Even this rabid raisin hater. That year at camp, not only did I manage gash the underside of my big toe on a rock during the pre-Trail sauna, but I also ground a substantial amount of dirt, sand, and potential Trail-stoppering infection into the raw wound. Now I know what you're thinking: "No showers, but they had a sauna?" Yes, we did. See, the sauna was part of this whole pre- and post-Trail ritual where, as it was explained to us, you'd sweat off all your dirt and then run into the ice cold lake to scrub yourself down with sand. Because: sweat+sand=CLEAN! It was this particular Widji ritual that nearly kept me back from Trail, but I was inventive. I limped heroically back to the cabin, grabbed a fistful of Q-Tips, and meticulously doctored my toe with the best antiseptic available in a cabin stuffed with adolescents: Sea Breeze. I applied the anti-acne cleanser to my open sore using the same method all teens did for their faces. I first swabbed on the Sea Breeze with one or two quick swipes and then I fanned my toe frenetically to assuage the burning sensation. (Sea Breeze hadn't yet invented their light blue formula for skin that wasn't rawhide-tough.) The treatment was a complete success, not only did the ugly skin flap heal with no infection, but that toe never, ever got zits. Although, I get to choose my own hiking boots these days, I don't think I would choose to do a Widji-type trip now. Granted, I'm way more actively outdoorsy now than I was then, but I'm also way more afraid of bears. I blame Discovery Channel shows like I Shouldn't Be Alive and, of course, Stephen Colbert. To minimize our bear interaction while on Trail, we'd either hang our food pack high in a nearby tree (bear can't reach it) or we'd cover the pack with our tin plates and cups anchored with rocks. The thinking here, I believe, is that as the bear dug at the pack, he'd make a lot of noise and scare himself off. What exactly was stopping the bears from dragging us out of our tents and eating us, I'm sure I have no idea. After all, it's not like we were covered in noisy tin plates. We never saw a bear, but I did wake up a few times in the middle of the night and heard something crunching in the leaves around our tent. Oh, and on more than one occasion, we found claw marks running down the length of the food pack tree in the morning. Yeah, I love you, Widji, but I definitely wouldn't do that again. Next Time at Camp Picky Eating: I remember nothing about the food we had in camp. All my Widji food memories are about the food we had on Trail.